Empathetics collects very basic information (such as, first and last name, email address, mailing address, phone number and such other demographic information as may be useful to us in delivering and improving the Service), that you may be asked to provide to us when you (i) use the Service, (ii) require support in using the Service, and/or (iii) participate in certain promotions. Although you may be required to provide a credit card number in connection with any purchases that you may make with respect to the Service, as more fully provided herein, we do not ask for or collect social security numbers, driver’s license numbers, bank account numbers or other information that is more purely personal to your non-professional life. The information we collect is used strictly as a means of contacting you and/or billing you for your purchases. (g) Using it for archival purposes, e.g., in order to retrieve your learning results. We collect your response to every question you answer; the time it takes you to respond to each question; the time you spend reviewing the results of each question. Our reporting system uses this data to display to instructors how each person is performing, including their levels of initial knowledge, and how long it took them to master the learning information. Log files: To enhance the quality of your experience during your use of the Service, we also collect certain technical information from your computer each time you request a page during a visit to our Service and store it in log files. This information may include your Internet Protocol (IP) address, your computer’s operating system, browser type, the addresses of pages you visit before and after visiting our Service, the date and time of your visit, and which pages you view during your visit to the Service. Profiles: We store information that we collect through cookies, log files, and/or other sources to create a “profile” of your preferences. Together with your purchasing history, email address and other information, including personally identifiable information, you provide to us, we use your profile to reduce the steps needed for you to use the Service, and to analyze and improve the content of our Service. We may collect information such as language, zip code, area code, unique device identifier, location, and the time zone where an Empathetics product is used so that we can better understand user behavior and improve our products and services. At various points in the use of the Service, you have the option to join our email list and receive information about our products, services and offers. Also, if you provide us with your email address when you register online or update your account, log-in, make a customer service inquiry, opt-in to receive our emails, make purchases via this website, and/or participate in a promotion or survey, you may automatically be added to our email list and receive marketing or promotional information from us. To opt out of receiving email marketing communications, you may unsubscribe by clicking the “Unsubscribe” link that is included with each such communication. In connection with most transactions that you enter on this website, a third party such as your employer will already have paid your registration fee to secure your access rights to the Service. To the extent that a third party does not pay for your access rights in connection with a transaction, you must enter your credit card information but Empathetics does not retain the credit card information you provide. Empathetics will send your credit card information directly to Bank of America (“BOA”), Empathetics’ merchant services provider. BOA will store your credit card information in accordance with its privacy policies. BOA does retain the credit card type and last four (4) digits of your credit card so you will have a record in your account of which credit card you have authorized Empathetics to charge for your purchases but all other information from your credit card is never captured or recorded by Empathetics. Employers. If you are using the Service pursuant to an agreement between Empathetics and a third party such as your employer, that third party (all such third parties, including corporations, academic institutions, government agencies, or otherwise, “Employers”) will have full access to all of your activity on the Service and to your information. You understand that the administrators designated by your associated Employer will be able to monitor all of your behavior on the Service and your information and may share that in accordance with the associated Employer’s policies. If you have questions about your Employer’s use of your information, you should consult your Employer. Third Party Products and Services: We may occasionally share your name and contact information with companies whose products and services may be of interest to you. Out of respect for your privacy, we allow you to opt-out of having your information shared with third parties for this purpose by adjusting the settings within the “Edit my account” section of the Service. Continuing Education Accrediting Bodies: When you use the Service for purposes of obtaining continuing medical education or continuing nursing education credits, we may also share your information, including your performance on any of our Courses, with the applicable accrediting body that you or your Employer may designate. Other Disclosures: We may collect, maintain, and disclose your information as required by law and when we believe that disclosure is necessary to protect our rights or property; to protect the rights, property, or safety of other persons; or to comply with law. We may also disclose your information in connection with an actual or proposed corporate transaction or insolvency proceeding involving all or part of the business or assets to which the information pertains. Empathetics takes precautions, including administrative, technical, and physical measures, to safeguard your personal information against loss, theft, and misuse, as well as against unauthorized access, disclosure, alteration, and destruction. Empathetics online services use Secure Sockets Layer (SSL) encryption on all web pages where personal information is collected. To make purchases from the Service, you must use an SSL-enabled browser such as Safari, Firefox, or Internet Explorer. Doing so protects the confidentiality of your personal information while it’s transmitted over the Internet. When you use certain areas of the Service, the personal information you share may be visible to other users and can be read, collected, or used by them. You are responsible for the personal information you choose to submit in these instances. For example, if you list your name and email address in a forum posting, that information is public. Please take care when using these features. You can help ensure that your contact information and preferences are accurate, complete, and up to date by logging in to your account settings. For other personal information, we make good faith efforts to provide you with access so you can request that we correct the data if it is inaccurate or delete the data if Empathetics is not required to retain it by law or for legitimate business purposes. We may decline to process requests that are unreasonably repetitive, require disproportionate technical effort, jeopardize the privacy of others, are extremely impractical, or which is not otherwise required by applicable law. We have security measures in place to protect the loss, misuse or alteration of your information under our control. Empathetics’ cannot, however, safeguard any data stored on your own personal computer or any public computer upon which you might elect to access the Service. In addition, the Internet is not a secure medium and we cannot guarantee the security of information transmitted via the Internet. 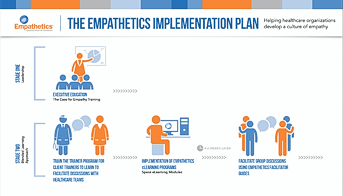 Empathetics does not knowingly collect personal information from children under 13. Given the nature of the Service, it is highly unlikely that a child under the age of 13 will have any reason to access the Service or to provide us with personally identifiable information. If we learn that we have collected the personal information of a child under 13 we will take steps to delete the information as soon as possible. Empathetics’ websites, products, applications, and services may contain links to third-party websites, products, and services. Our products and services may also use or offer products or services from third parties. Information collected by third parties, including such things as location data or contact details, is governed by their privacy practices. We encourage you to learn about the privacy practices of those third parties. Beginning on January 1, 2005, California Civil Code Section 1798.83 permits our users who are California residents to request certain information regarding our disclosure of personal information to third parties for their direct marketing purposes. To make such a request, please send an email to info@empathetics.com.